The Tools toolbar contains all the main tools you need to work in Harmony. In the default workspace, this toolbar located on the left-most side of the interface. A small triangle at the lower-right corner of a tool indicates additional tools under the main tool. To access these tools, hold down the left mouse button until the additional tools appear, then select one. By default, the Tools toolbar displays several of its tools in pop-up menus that must be opened. It is possible to make the Tools toolbar display every tool in its individual button instead by enabling the Flat Tools Toolbar preference. This makes the selection of tools quicker. However, because there is not enough vertical space to display all tools, some tools will be hidden from the Tools toolbar by default. Which tools are displayed in the Tools toolbar when Flat Tools Toolbar is enabled can be customized. The order in which tools are listed in Flat Tools Toolbar mode can also be customized. Select Edit > Preferences (Windows/Linux) or Harmony Essentials > Preferences (macOS). Press Ctrl + U (Windows/Linux) or ⌘ + U (macOS). 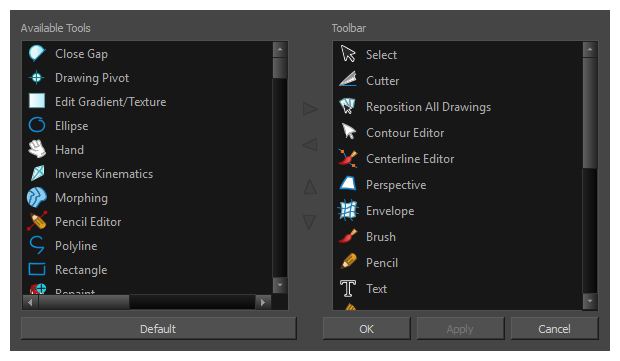 In the Options section, select the Flat Tool Toolbar option. Click OK and restart Harmony. Right-click on the Tools toolbar and select Customize. The Toolbar Manager dialog appears. In the Available Tools list, select each tool that you want to add to the Tools toolbar, then click on the Add the selected tool to the toolbar button. In the Toolbar list, select each tool that you want to remove from the Tools toolbar, then click on the Remove the selected tool from the toolbar button. Allows you to select and reposition, scale, rotate and skew brush strokes, pencil lines, shapes and other parts of your artwork. Allows you to cut a part of your artwork, then reposition, scale, rotate and skew it. Allows you to reposition, scale, rotate and skew all drawings in the current layer. Allows you to edit the vector contours of brush strokes, pencil lines and shapes in your artwork. You can add, remove, tweak and move vector points, move the Bezier handles of the vector points as well as deform vector outlines. Allows you to tweak and deform a brush stroke by manipulating the points at the centre of its line rather than its contour. Allows you to optimize contours and lines by removing its extra points, making them easier to edit. Allows you to deform artwork by applying a perspective effect on it. Allows you to deform and warp artwork by moving points and tweaking lines in a grid. Allows you to adjust the position, angle and size of gradients and textures in a colour zone. A pressure-sensitive tool for creating a contour shape with a thick and thin line effect, as if created with a paint brush. A pressure-sensitive tool for drawing outlines. Pencil lines are made of central vector lines, making them easier to tweak and edit than brush strokes. Allows you to add text and to format it. A pressure-sensitive tool for erasing parts of a drawing. Allows you to fill colour zones with a colour or texture. Allows you to quickly fill empty zones in your artwork with a colour or texture, leaving filled zones unchanged. Allows you to empty filled colour zones of their colour and texture. Allows you to create invisible lines that can serve as colour zones that can be filled, or close the gaps in existing colour zones. 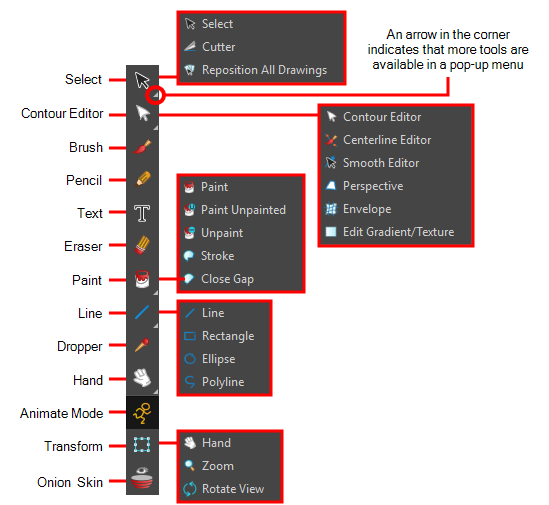 Allows you to close open shapes so that they can be filled with the Paint tool. By drawing a stroke near a small gap in a shape, this tool will create a small invisible stroke connecting the two closest points around the gap. Draws a straight line segment going from one point to the other. Allows you to draw shapes, segmented lines or complex curved lines by clicking to create each point in the sequence of line segments. Allows you to select a colour by clicking on a colour in your artwork. Allows you to pan the Camera and Drawing views. Allows you zoom in and out of the Camera and Drawing views. Lets you rotate the Camera and Drawing views just like with a real animation disc. Enables the Animate mode which records the position, rotation, scale, skew, etc. of objects as keyframes in the Timeline view. Turn off the Animate mode to reposition objects for the entire scene. When the Animate mode is disabled, keyframes are not created when an object's parameters change. Transform Allows you to select drawing layers and position, rotate, scale and skew them. Displays the previous and next frames of an animation. Useful when animating cut-out characters.